Following (extremely) closely on the heels of reading Jane Austen Ruined My Life, I had to pick up and devour Mr. Darcy Broke My Heart . Almost as soon as I had gotten started reading the book, I was done with it. The book is an amazingly quick read which is a disappointing thing, only because it is so very enjoyable. Much like it's predecessor, I think this book would make an excellent chick flick. Actually, I enjoyed Mr. Darcy Broke My Heart more than Jane Austen Ruined My Life. No qualms or hesitations in the recommendation of this particular story. In this book, we meet Claire Prescott who is attending a seminar on Jane Austen which is being given at Oxford. She wasn't originally intended to be in attendance at this seminar. Rather, her sister was to have gone but unexpected pregnancy complications keeps Claire's sister home bound and so Claire goes in her place. She doesn't really know what she's doing there but, when all is said and done, she begins to know her own heart and mind as a result of one week in this stately and dramatic town. 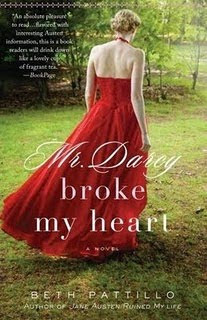 Mr. Darcy Broke My Heart is not a sequel to Jane Austen, which I was somewhat surprised by. I just assumed it was a continuation of the first story but ended up thoroughly satisfied that it was not. Like Emma Grant in the first book, Claire runs into a group known as the Formidables, who are a secret group committed to preserving and protecting Jane Austen and her works. It's a true fact that Jane's sister, Cassandra, destroyed all of Jane's letters upon her death and at Jane's request. The question Beth Pattillo explores with both of these books about Jane Austen is whether any writings survived after all. These books raise fun questions and Beth Pattillo brings both Jane and her modern counterparts to life in a thoroughly enjoyable manner. This is one of those rare moments where I want to just say, "I liked this book a whole, whole lot, with two scoops of ice cream and a cherry on top!" But that sounds silly, doesn't it? But it's not silly after a stay at home mommy day when you just want to relax into a good book and be amused. This book hit the spot for me and I enjoyed every single non-interrupted minute of it! Lisa reviewed this title over at 5 Minutes for Books and enjoyed it also. If you missed my review of Jane Austen Ruined My Life then click on the title and feel free to catch up. I've enjoyed your book reviews and have been adding books to my TBR list like crazy. I'm reading Willoughby's Reture by Jane Odiwe. I'll keep you posted. Oh! I did a write up about an Indy bookstore that opened in my area. So should I buy Mr Darcy Broke My Heart? I didn't bring enough books to be in a small hotel room with three children.. I am going to go out and buy a couple. I don't know of a good used book store so it has to be an 'in print' paperback. (from B&N) Which makes my choice difficult because I would rather find hard cover old ones! Sky - YES! (But I already answered you on the side.) I can't think but that you'll love it! I'm so happy to see you enjoyed this one so much, as I'll be reading it soon. I haven't read anything by this author, so it looks like I'm in for a treat!